Sterkfontein (Afrikaans for Strong Spring) is a set of limestone caves of special interest to paleo-anthropologists located in Gauteng province, about 40 kilometres (25 mi) northwest of Johannesburg, South Africa in the Muldersdrift area close to the town of Krugersdorp. The archaeological sites of Swartkrans and Kromdraai are in the same area. Sterkfontein is a South African National Heritage Site and was also declared a World Heritage Site in 2000. 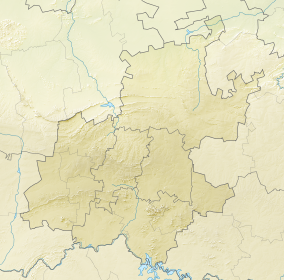 The area in which it is situated is known as the Cradle of Humankind. The Sterkfontein Caves are also home to numerous wild African species including Belonogaster petiolata, a wasp species of which there is a large nesting presence. Numerous early hominin remains have been found at the site over the last few decades. These have been attributed to Australopithecus, early Homo and Paranthropus. Modern excavation of the caves began in the late 1890s by limestone miners who noticed the fossils and brought them to the attention of scientists. In 1936, students of Professor Raymond Dart and Dr. Robert Broom from the University of the Witwatersrand began concerted excavations. The caves yielded the first adult Australopithecine, substantially strengthening Dart's claim that the skull known as the Taung child (an Australopithecus africanus) was a human ancestor. There was a pause in excavation during World War II, but after the war Dr. Robert Broom continued excavations. In 1947, he found a nearly complete skull of an adult female (STS 5) A. africanus (or possibly that of an adolescent male). Broom initially named the skull Plesianthropus transvaalensis (near-man from Transvaal), but it became better known by its nickname, Mrs. Ples. Mrs. Ples is now defined as a member of A. africanus. 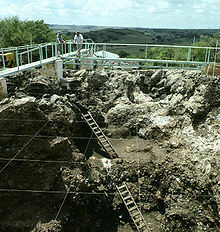 In 1997, a nearly complete skeleton of a second species of Australopithecus (StW 573) was found in the caves by Ronald J. Clarke; extraction of the remains from the surrounding breccia is ongoing. The skeleton was named Little Foot, since the first parts found (in 1995, in storage) were the bones of a foot. Excavations continue to this day, and finds now total some 500 hominids, making Sterkfontein one of the richest sites in the world for early hominids. The Palaeo-Anthropology Scientific Trust (PAST), a non-profit trust fund established in 1993, sponsors over 90% of the research undertaken at Sterkfontein and was instrumental in its nomination as a World Heritage Site. The Member 4 deposits containing the Australopithecus africanus fossils have been dated to between 2.6 and 2.0 Ma, with the Sts5 "Mrs. Ples" fossil estimated to date to between 2.05–2.01 Ma based on a combination of uranium-lead dating and palaeomagnetic analysis and electron spin resonance dating The StW 573 partial skeleton (Little Foot) was recovered from a separate infill at the site within the confines of the Silberberg Grotto. It is estimated to be around 2.6–2.2 Ma based on a combination of uranium-lead dating and palaeomagnetic analysis and belongs to a second species of australopith, Australopithecus prometheus. In contrast, surface exposure dating of sediments indicate that skeleton StW 573 has an age of approximately 4 million years. While the flowstone dated in the uranium-lead dating has been shown to have formed later than the fossil, an age estimate of ~3 Ma suggested by the same authors has little firm basis. The palaeomagnetic analysis  remains the most credible age estimate based on the current data as it included work on both sediments and speleothem. A slightly younger deposit (StW 53 infill) dated to between 1.8 to 1.5 Mya has revealed the remains of a specimen of early Homo (StW 53). StW 53 has been described as similar to Homo habilis or as a novel new species Homo gautengensis. No stone tools were associated with the fossil, but StW 53 has evidence for stone tool cut-marks. Member 5 contains Oldowan and Acheulian stone tools as well as specimens of early Homo and Paranthropus and is dated to between 1.6 and 1.1 Mya. Wikimedia Commons has media related to Sterkfontein Caves. ^ "Sterkfontein Caves, Zwartkrans, Krugersdorp District 9/2/233/0004". South African Heritage Resources Agency. Retrieved 16 September 2013. ^ "Fossil Hominid Sites of South Africa". UNESCO World Heritage Centre. n.d. Retrieved 2018-08-23. ^ a b c d Herries & Shaw 2011. ^ Pickering & Kramers 2010. ^ Herries et al. 2010. ^ Herries et al. 2013. ^ Partridge et al. 2003. ^ Bruxelles et al. 2014. ^ Pickering, Clarke & Heaton 2004. Balter, Michael (14 March 2014). "'Little Foot' Fossil Could Be Human Ancestor". Science. Retrieved 2018-08-23. Bruxelles, Laurent; Clarke, Ronald J.; Maire, Richard; Ortega, Richard; Stratford, Dominic (2014). "Stratigraphic analysis of the Sterkfontein StW 573 Australopithecus skeleton and implications for its age". Journal of Human Evolution. 70: 36–48. doi:10.1016/j.jhevol.2014.02.014. ISSN 0047-2484. PMID 24698198. Curnoe, D. (2010). "A review of early Homo in southern Africa focusing on cranial, mandibular and dental remains, with the description of a new species (Homo gautengensis sp. nov.)". HOMO – Journal of Comparative Human Biology. 61 (3): 151–177. doi:10.1016/j.jchb.2010.04.002. PMID 20466364. Herries, A.I.R. ; Hopley, P.J. ; Adams, J.W. ; Curnoe, D.; Maslin, M.A. (December 2010). "Letter to the editor: Geochronology and palaeoenvironments of Southern African hominin-bearing localities—A reply to Wrangham et al., 2009. "Shallow-water habitats as sources of fallback foods for hominins"". American Journal of Physical Anthropology. 143 (4): 640–646. doi:10.1002/ajpa.21389. PMID 20872806. Herries, Andy I.R. ; Shaw, John (2011). "Palaeomagnetic analysis of the Sterkfontein palaeocave deposits: Implications for the age of the hominin fossils and stone tool industries". Journal of Human Evolution. 60 (5): 523–539. doi:10.1016/j.jhevol.2010.09.001. ISSN 0047-2484. PMID 21392817. Herries, Andy I. R.; Pickering, Robyn; Adams, Justin W.; Curnoe, Darren; Warr, Ginette; Latham, Alf G.; Shaw, John (2013). "A Multi-Disciplinary Perspective on the Age of Australopithecus in Southern Africa". The Paleobiology of Australopithecus. Vertebrate Paleobiology and Paleoanthropology. pp. 21–40. doi:10.1007/978-94-007-5919-0_3. ISBN 978-94-007-5918-3. ISSN 1877-9077. Keeping, Malcolm G (1997). "Social Behavior and Brood Decline in Reproductive-phase Colonies Of Belonogaster Petiolata (Degeer) (Hymenoptera: Vespidae)". Journal of Insect Behavior. 10 (2): 265–78. doi:10.1007/bf02765559. Partridge, T. C.; Granger, D. E.; Caffee, M. W.; Clarke, R. J. (2003). "Lower Pliocene Hominid Remains from Sterkfontein". Science. 300 (5619): 607–612. doi:10.1126/science.1081651. ISSN 0036-8075. Pickering, T.R. ; Clarke, R.J.; Heaton, J.L. (2004). "The Context of Stw 573, an early hominid skull and skeleton from Sterkfontein M2: taphonomy and palaeoenvironment". J. Hum. Evol. 46 (3): 277–295. doi:10.1016/j.jhevol.2003.12.001. PMID 14984784. Pickering, R.; Kramers, J.D. (2010). "Re-appraisal of the stratigraphy and determination of new U-Pb dates for the Sterkfontein hominin site, South Africa". Journal of Human Evolution. 59 (1): 70–86. doi:10.1016/j.jhevol.2010.03.014. PMID 20605190.